Over the years, we have seen numerous blockchain platforms aiming to launch self-sufficient smart contracts and DApps. Some of the good examples are Ethereum, NEO, and Qtum. And each of them took different routes to implement their ideas and goals. However, there is one problem that plagues them along with similar blockchains – governance. And if you have paid attention, one of the main themes of 2018 has been about governable blockchains. Well, because blockchains like Ethereum, NEO or Qtum aren’t self-governed and hence have much reliability on few human players for the same. But there is one blockchain platform that is doing it in a totally different way. So much so, it looks like they have solved the problem. 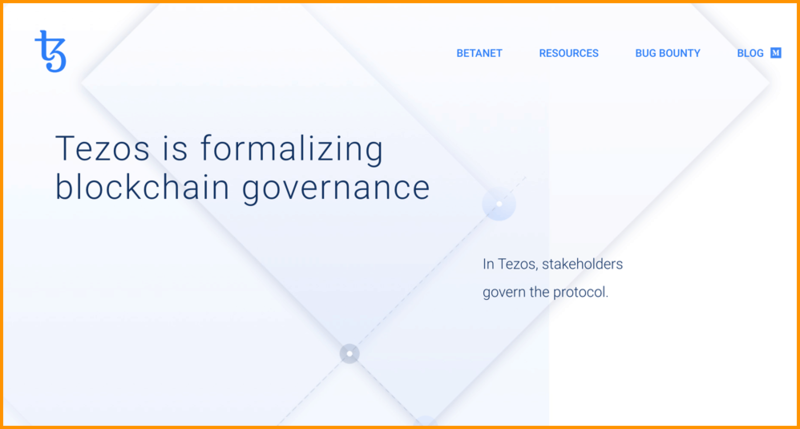 Tezos is an open-source decentralized blockchain platform for smart contracts and decentralized applications with a formalized governance model. Here, the governance model is not ad-hoc or unplanned. Rather, it is a self-evolving one. That’s why Tezos dubs itself as self-amending blockchain which can evolve as per the needs of the industry without getting fragmented time and again with hard forks. The Tezos blockchain is developed in a modular style with a generic and self-amending crypto-ledger. And this is achieved by an agonistic native-middleware called as ‘Network Shell’ (More on this later). The network protocol is the gossip protocol which is responsible for peer listening and broadcasting between nodes. The transaction protocol is responsible for the transactional layer and the accounting model a blockchain implements for its transactions, like UTXOs for Bitcoin. The consensus layer, as its name suggests, is for reaching agreement on the state of transactions that have occurred or will occur. Here, transaction and consensus protocols combined are sometimes referred to as blockchain protocols. 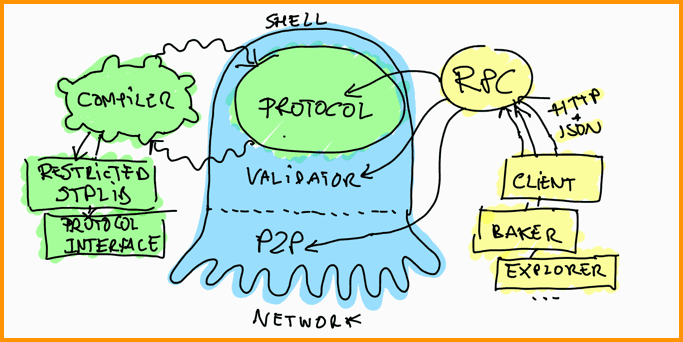 And the network shell is responsible for communication between the network protocol and the blockchain protocols. And even these protocols can be amended by the network shell upon consensus from the community. Hence it works by maintaining the best chain known to the client. This is called self-amending blockchain or on-chain governance. The self-amendment feature helps in the upgrading of blockchain without undergoing a hard fork. And hard forks are generally not good for the community as it destroys the network effects for which the community has worked so far for. Tezos uses Michelson, which is a functional programming language for smart contracts and DApps. Having such a language is very useful as it helps in formal verification. Formal verification simply means, mathematically proving that a certain piece of code will behave as expected and as coded. But this doesn’t mean it is full proof or no bugs will be there in the code after formal verification. Instead, it acts as a caution to prevent costly bugs as we have seen during the DAO Ethereum attack. Tezos is a delegated proof of stake system that requires one to stake a certain number of Tezos token to participate in the consensus over the blockchain. The process of staking Tezos tokens (XTZ) is called baking in Tezos’ ecosystem through which nodes or participants can earn more XTZ and simultaneously secure the blockchain. 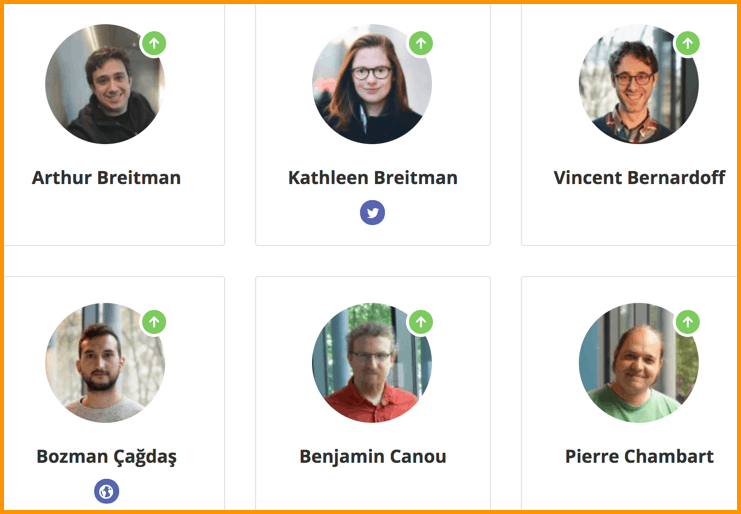 The Tezos team is comprised of an amazing couple and also its co-founders who have withered the hard test of time in launching Tezos amongst so many hurdles that we will discuss in the end. Initially, there were 10 billion tokens available for the sale but this was not the final supply. Instead, the total token supply was decided based on the number of tokens sold in the ICO in mid-2017. And it was one of the biggest ICOs to be concluded in the history of cryptocurrencies at that time because it had raised $232 million. 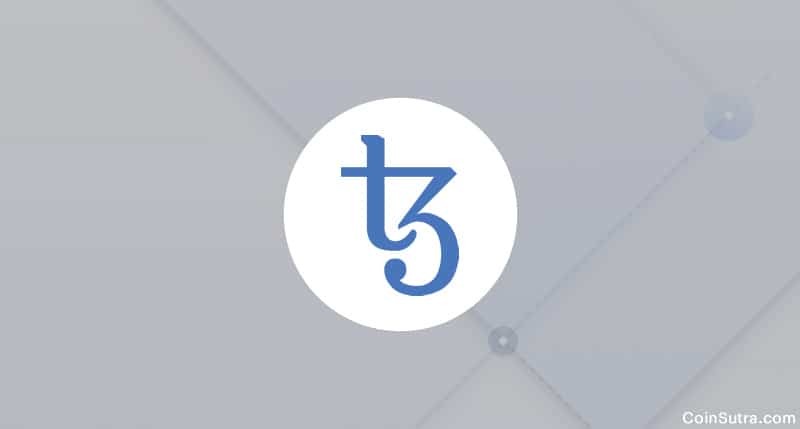 Currently, as per CoinMarketCap, the total circulating supply of Tezos is 607,489,041 XTZ and the current price of each unit is $2 which values it at approximately $1.2 billion (at the time of writing this article). Buying Tezos is not very easy as very few exchanges currently are buying/selling Tezos. Part of which is due to its extremely delayed launch. As it is a pretty new entrant to the crypto market, finding a hardware wallet for Tezos is not possible as of now. I believe Tezos’ future will exciting but before discussing the future, let us take a look at the history. Well, after Tezos’ successful ICO there was a rift between the founders and Tezos foundation’s president. Plus, there were class action lawsuits filed and SEC was too involved declaring Tezos as security. But all those issues have been dealt with by the Tezos’ team bravely but this has led to a delay of almost 8-10 months in the project’s development. Here is full story of Tezos’ saga as told by its founder. Tezos finally launched its beta net at the start of July 2018. It is a testnet that is continuously being developed and improved by its team. Also, it is all set to launch its mainnet launch in Q3 2018. As much as I commend the founders and the dev team on the launch of their beta, it was disappointing to not be able to find a properly laid out roadmap of a quarter billion dollar project. Also, when you are competing with other blockchain platforms and smart contract platforms like Ethereum and NEO, you need to have a plan. Plus, your website should have proper documentation like Lisk or Ethereum has to make it easier for developers to adopt you. On these fronts, Tezos is clearing lagging behind but if we give them benefit of doubt for some time as they have just recovered then I think these things should be in place with the launch of mainnet launch. Otherwise, it is going to be very difficult for Tezos to survive. Lastly, their smart contract language (Michelson) is pretty unknown to the world which will also take a decent learning curve for the developers. So that’s all from my side in this article. Let me know if I have missed on something important in this analysis. Will be happy to hear about your constructive feedback in the comments section below. Binance Vs. Bitmex: Which Cryptocurrency Exchange To Choose?